A look at Cavalia’s groundbreaking role in equestrian entertainment, with founder Normand Latourelle. I’ll always remember the sight of Normand Latourelle on a tractor moving mounds of sand against the stable tent during a huge storm when Cavalia was at the beach in Santa Monica. The groundbreaking equestrian spectacle was still in its infancy at that point, little more than a year old. 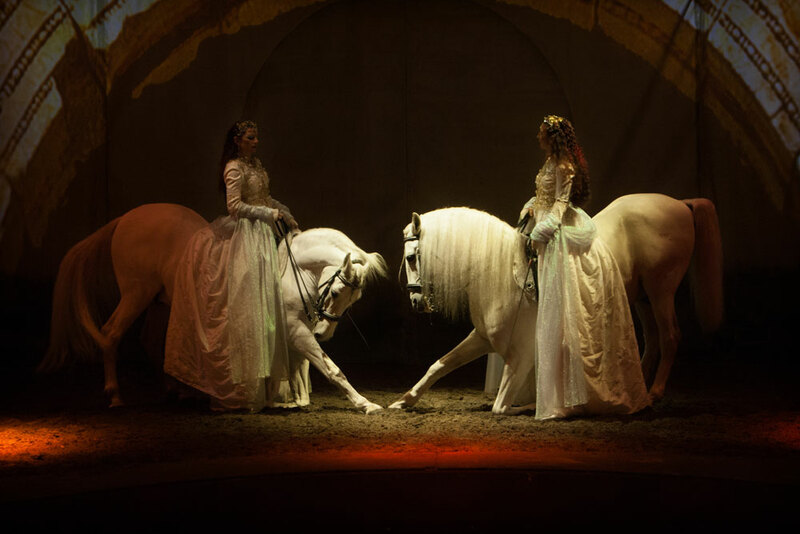 Yet, since the company raised its first Big Top in Quebec, the extraordinary determination of a non-horseman and creative genius has brought more than seven million people the unforgettable experience of horses through two touring productions. The company’s namesake and original production, Cavalia, has traveled around the world and is now in China. Latourelle’s second and even bolder spectacle, Odysseo, began touring North America in 2011 and is reportedly the largest touring production on the planet. “My dream is that in 50 years, you’re going to open the dictionary and read the definition of Cavalia,” said Latourelle in 2003, the first time we spoke, when Cavalia was still in rehearsals before its debut. Fifteen years later, no dictionary is required. Scores of articles, video clips and social media of all forms teem with facts, photos, and fans sharing experiences the world over. One of Cirque du Soleil’s four original cofounders, Latourelle always had a gift for spotting exceptional talent and making things happen. The visionary behind many varied and memorable shows, Latourelle helped build Cirque du Soleil, serving as VP and general manager from 1985 to 1990. Known for innovative and adventurous productions, a large-scale multimedia summertime show he created in Quebec called “Légendes Fantastique“ became the (then) non-horseman’s greatest inspiration. A horse he put on stage stole the audience’s attention. Latourelle’s, too. “The other thing is, I’m both the producer and the creator,” he continues. “Especially on Odysseo, most of the ideas are from me. It’s very rare I think, to both create and produce what I create. If I relied on a third party to invest the money, to take the risk, my project would probably never happen. His determination is paired with exceptional resourcefulness. “When Cavalia started in 2003, we were in Shawinigan, a small town about two hours north of Montreal. I made a deal with the mayor. She supplied the arena for us to rehearse for free and the land for nothing,” remembers Latourelle. “She didn’t asked us to do anything, except to do three shows for the locals. Shawinigan is only 50,000 people. I put tickets on sale for three shows. Within 30 minutes, the mayor called panicking. She said, ‘Everybody is complaining, everybody wants to see the show, but you have no tickets!’ 6,000 tickets had sold within 30 minutes. I called her back and said, ‘We’re going to do three more shows.’ An hour after we put the tickets on sale, she called me again. ‘It’s not enough!’ We went like that for four weeks.” Latourelle finally told the mayor Cavalia had to leave. Four years later, things had heated up for Cavalia indeed, as horse lovers and the mainstream public (many with no prior exposure to horses) experienced what happens when the horse-human bond and theatrical arts are combined with high-tech special effects inside a big top. Cavalia was still on its inaugural North American tour when Latourelle was awarded the Order National du Québec for his achievements. “I had to do the same thing with some of the riders and the trainer. I switched part of the team of Cavalia to Odysseo and the other way around. Again, I’m very stubborn. I did not accept the ‘no.’ I said, ‘I’m going to do it, whatever it costs.’ At the end of the day, you can realize how much it costs—just to charter an airplane from Taipei to Los Angeles and then from Los Angeles to Hong Kong. And all the permits and all the tests we have to do on the horses. Currently, Latourelle is at work adapting Cavalia for an engagement in Nanjing, China. “The city wants us to make the show one hour because it’s a very affluent tourist city,” says Latourelle. “It’s a big job to keep the best and transform a two-hour show in to one hour—it’s almost a new creation.” Latourelle’s younger son, Mathieu, 37, who directs Cavalia’s tour in China, has traveled with the show from the start. Back in Quebec, his son David, 43, works as the family-run company’s vice president. 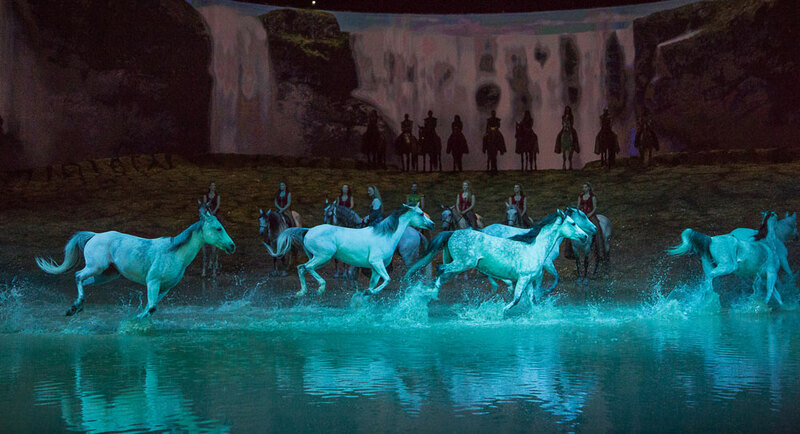 Meanwhile Odysseo, seen by more than 2 million people since its 2011 debut, continues its North American tour with 70 horses that vacation between stops and can kick up their heels in outdoor paddocks in each city, a practice established by Cavalia 15 years ago. Odysseo has both indoor and outdoor warm-up areas.  A total of 110 semi-trucks are required to transport Odysseo, the world’s largest touring production.  A specially designed white big top was created in Europe, and allows the weight of the structure to be shifted from masts to three arches above the tent. Above the stage hangs an imposing technical grid capable of supporting 80 tons of equipment, including a full-sized merry-go-round! On stage, a lake emerges during the breathtaking finale of Odysseo, made possible by an underground drain system that releases 40,000 gallons of recycled water on stage. This logistical masterpiece is reconstructed at each tour stop. cross, Quarter Horse, Selle Français, Thoroughbred, Andalusian (P.R.E.) and Warlander.  Fifty artists—riders, acrobats, aerialists, dancers, and musicians—perform in Odysseo. They come from 11 countries around the world, including the United States, Canada, Brazil, France, Italy, Guinea, South Africa, Poland, Russia, Spain and Ukraine.  A team of 20 people, including a stable manager, two veterinary technicians, a farrier, and several grooms care for the horses’ well-being. In each city, horses are stabled next to the same neighbors to ensure a familiar environment—a practice followed by Cavalia’s productions from the beginning.  Paddocks built at each tour stop are used for daily turnout. Each year, the horses consume 15,000 bales of hay, 70,400 pounds of grain, and 1,750 pounds of carrots.  Many horses are braided after the show to keep long, flowing manes from tangling or breaking. It takes 15 to 45 minutes per horse, depending on the length of the mane.  There are 350 costumes and 100 pairs of shoes and boots used in Odysseo. Artists may have up to seven different costumes.  In no more than 30 seconds, an artist may need to do a quick costume change between numbers. An author, journalist and media consultant based in Southern California, ELIZABETH KAYE McCALL worked as the horse industry liaison for Cavalia during its inaugural North American tour. She first interviewed Normand Latourelle before Cavalia debuted, while writing her book The Tao of Horses: Exploring How Horses Guide Us on Our Spiritual Path, along with Cavalia’s original co-stars and equestrian choreographers.